I use the word “trigger” A LOT lately. And, through extensive communication, I realize that not every knows what it means when it comes to dog training. 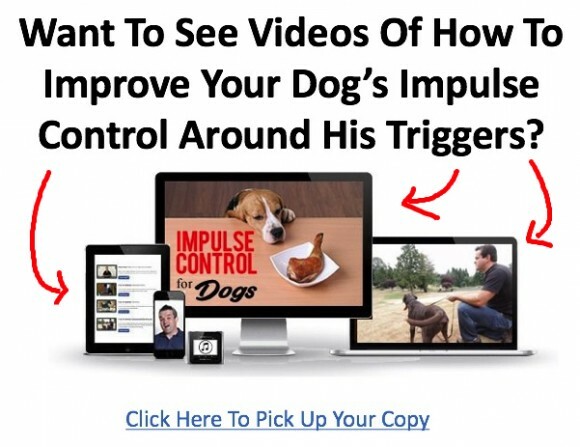 So, what does “trigger” mean when it comes to dog training? What do you think about when someone says trigger? Most often, most of us probably picture a gun when we are thinking of the basics of the word. a small device that releases a spring or catch and so sets off a mechanism, especially in order to fire a gun. cause (an event or situation) to happen or exist. 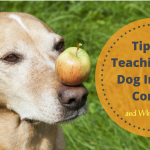 While “trigger” doesn’t always have to signify a negative thing in normal human conversation, (for instance, “That song always triggers childhood memories”), usually it does in dog training. 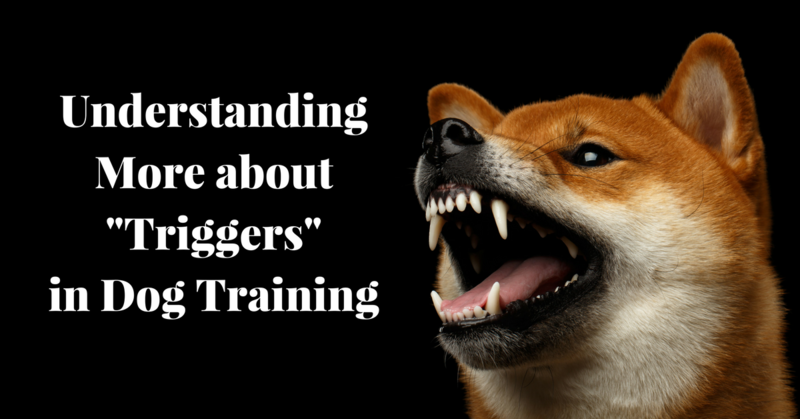 We rarely talk about “triggers” than cause happy things when referring to training a dog. To “trigger” usually means to do something fast. To set off, spark provoke, or stir up quickly. 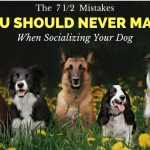 It usually denotes a lack of clear thinking and simply a reaction to something, which is usually not a great thing when we are talking about dog training. For instance: antonyms or the opposite, of “trigger” are to defuse, to block, to check. The antonyms reflect thinking. When I talk about triggers, I am usually referring to negative guttural or basic emotions like fear and aggression. In all honesty, we aren’t worried about things that “trigger” good emotions like happiness or excitement because these emotions don’t really evoke negative behaviors. But, even then, we don’t want a dog that just “reacts” we want to teach our dogs control and thoughtfulness. 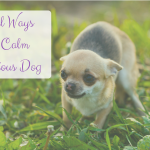 If your dog has a major negative trigger something that almost immediately elicits a fearful or aggressive response. 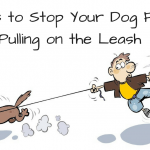 It is essential to do your best to avoid that trigger while you begin to teach your dog control and thoughtfulness. 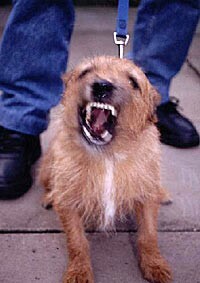 For instance, if my dog is dog aggressive, his trigger is seeing other dogs. So while I am working on teaching my dog control, and counter conditioning (or changing) his response I would want to avoid other dogs at all costs. Remember that aggression is self rewarding at some point. Even if I am teaching him other coping mechanisms and how to act and NOT react around other dogs in a calm and controlled environment, if I allow him to continually work himself up around his trigger (other dogs), his reactivity and negative triggered behavior is outweighing all the hard work we are doing the rest of the time. This is why I recommend people STOP walking their dogs if they are trying to control a serious reactive behavior. 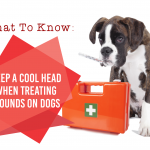 You may begin to add your dog’s trigger in a slow and controlled environment. Previous Post What You Don’t Understand About Your Dog Coming When CalledNext Post Why Does My Dog Chew His Feet and Nails? 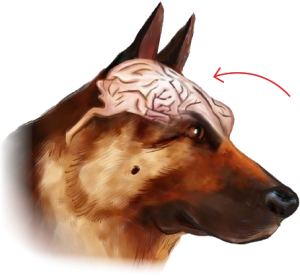 Hi, i have a german shepherd and he is too aggressive against other animals like goat, horse, buffalo etc.I think its a negative trigger but i don’t know how to come out from this problem. Can your techniques work with an old dog. I have a 12 year old Maltese. Also I live in a small studio apartment and don’t have easy access to a park so can your techniques be done in a small space? how can I teach my dog not to run away from me. 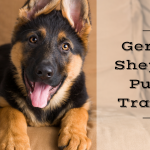 Search my articles for “come” or enroll in our short course which will teach you to get your dog to come when called. I have a dog that eats everything!!! He has been diagnosed with PICA. Any ideas?? He has had one bowel obstruction surgery so far, and he also has a lot of anxiety. If I muzzle him he will not play he just lays around and pouts. 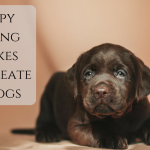 search my articles for why I love a muzzle and they will teach you how to introduce it positively. I have a 7.5 month old labradoodle who still jumps up and grabs my arm or hand. She doesn’t bite down but will hold on. Help me. I am desperate to find what triggers this. Some times it is when I take her leash. She still bites leash at times. It does hurt. I am a senior. Yelping and no are not the answer. Seems to be a very resistive puppy to any thing she doesn’t like. She needs impulse control! I suggest you look into our impulse control program. 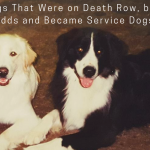 You can email customer service at info@thedogtrainingsecret.com to get enrolled. I have a 13 month old border collie. She has a sweet disposition but I have never seen a dog as active as this one. She wants to play all the time. I need her to learn to stay, not jump on me, bring the ball back and sometimes just relax. She does sit when you tell her but not for long. She is very intelligent and seems to know what you say, just can’t sit still long enough or rest. Wearing me out. 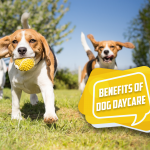 Border Collies were bred to work all day, you are in for a lifetime of an active dog! I suggest you find things for her to do like herding, dock diving, agility, frisbee etc. Just barely 2 yr old Husky still mouthing us, jumping on us or pawing us (those claws hurt) despite use of all the trainers advice. She’s able to learn lots of things very well but this and nice leash manners have not gone too well-in a year’s time! People keep saying she’s just still too puppy. Phooey! No excuse! Soon to add another pup. This one needs better manners!!!!!! My 4 yr old toy poodle weighs 4 1/2lbs. He goes ballistic at the site of other dogs or animals for that fact. If loose, he will literally charge at the dog and get in its face. The bigger the dog, the worst he is. He is stressed in a public place at the mere scent of other dogs. I took classes with 5 different trainers and tried from gentle to extreme techniques with no luck. I have all of your classes on this subject, but nothing has worked. I cannot distract him at all, to get his attention. When I try to hold him, he squirms so bad he is like holding a fish. I can put a piece of meat in front of his nose, make a sound, turn his head from the dogs, take him away and nothing I tried has gotten his attention as a distraction for even seconds. I literally do not exist in his eyes during his fit. I am so sad as I want so bad to take him to most places with me. I never had a dog like this. I had dogs all my life. I live alone in a remote area so to have someone help me work with him is difficult. Please help. I am desperate! I have a 12 year old Yorkie that is aggressive, but I cannot tell what his ‘trigger’ is. He can be loving one minute and then turn and bite you the next.